It is starting to get warm in the days. It is downright hot further south, in Delhi, but we will catch up soon I dare say. The ashram here is about 500 meters from the Birbhadra temple, which is where Shiva's expansion who messed up Daksha's sacrifice went and rested after his rampage. There is a steady stream of pilgrims going there today and of course, the mikes have been blaring since well before dawn this morning. There is a mela with ferris wheels and other rides, and the street is lined with vendors of jilebis and pakkoras. The specialty here seems to be some kind of kazoo horn that everyone is tooting on. People are in their temple-going best. Numbers of people are wearing silver foil and colored tissue party hats. But the lineup for darshan at the temple was too long so I turned back to go to Swami Ram's Sadhan Mandir. 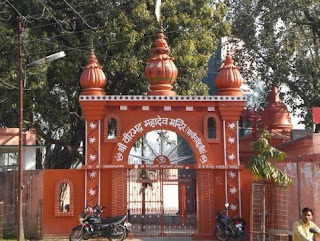 There are two Swami Ram ashrams here, about two kilometers apart. The original one is closer to the city. The Sadhaka Gram is where I am. 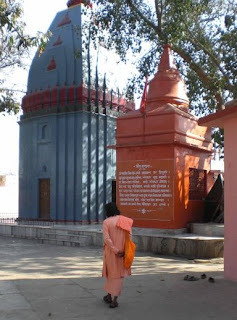 It is newer and larger and was built by Swami Veda. There was an elaborate Shiva puja and abhisheka first at the older ashram and the other one is going on here now as I write. There are three or four brahmins living here in the ashram (someone told me there are about 70 paid workers on the staff here, many of whom are living on site). These brahmins come into their own on special occasions like today and they seem to be quite good at what they do. They were accompanied by half-a-dozen others today. The chanting of mantras and hymns went on vigorously for almost three hours non-stop, with accompanying gestures and appropriate priestly roles played by different individuals. I was quite impressed overall. I shall not stay up all night. Bhom Mahadeva.